But even if you do suffer for righteousness’ sake, you will be blessed. Have no fear of them or be troubled, but in your hearts reverence Christ as Lord. Always be prepared to make a defense to anyone who calls you to account for the hope that is in you, yet do it with gentleness and reverence; and keep your conscience clear, so that, when you are abused, those who revile your good behavior in Christ may be put to shame. For it is better to suffer for doing right, if that should be God’s will, than for doing wrong. For so many years I was afraid of being open about my faith. I was also timid to admit I was Catholic. Would my beliefs be challenged? Would I be confronted and have no answers, only to concede that I did not know the faith I professed? Would one of unbelief have the words to convince me that my faith is in vain? Would I be ridiculed for the Church’s teachings, many of which seemed to me at the time, to be so out of touch with today’s reality? I was a coward! I was conforming MYSELF to the world so that the world would love me. I wanted to fit in. I wanted to be who the world said I should be and believe what the world professes to be true. I didn’t realize that as Christians, we are set apart. We are called to holiness. We aren’t supposed to do what “they” do, or say what “they” say. If the world hates you, know that it has hated me before it hated you. If you were of the world, the world would love its own; but because you are not of the world, but I chose you out of the world, therefore the world hates you. Being a Christian doesn’t mean I will ever be perfect. It doesn’t mean that I have not sinned in big ways – I have! But the Lord is merciful indeed and I am so thankful that I now have eyes to see and ears to hear. The more I reject the ideals of this world, and instead put my trust and hope in the Lord – the greater my sense of peace and joy. So, where does my hope come from? It comes from the LORD and it gives me the peace and blessed assurance that I need to confidentially proclaim His truth. This is something I am working on doing more and more – but fear still creeps in sometimes. 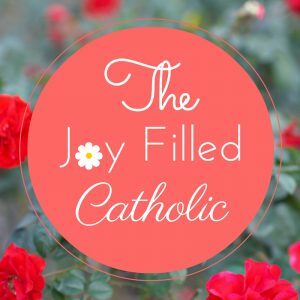 Through my deep desire to know my faith and understand what it means to be a Catholic, I made a remarkable discovery. The Church is so wise. Thanks to solid Catholic resources, along with reading and studying the Bible, I now understand the “whys” behind many of Her teachings. Teachings which I only rejected before, because I didn’t understand them. I love, honor and respect Holy Mother Church. These are just a few of the dynamic resources that I found to help me understand my faith! There are a ton of others. Don’t be overwhelmed by the list, just pick one or two to explore. You’ll soon find yourself looking for others though, so keep this list handy! God desires us all to be part of His one Holy Catholic and Apostolic Church. He desires us to lead others to Him and build up His Kingdom on earth and He gives us the grace to do this. He desires us to be holy and dwell with Him forever in Heaven. He desires us to be filled with peace and joy. Brothers and sisters, we are called to much more than what this broken world can offer us, but while we are here, we must be beacons of light and love for others.